Cornell University researchers have created a machine that can build copies of itself. Their robots are made up of a series of modular cubes -- called "molecubes" -- each containing identical machinery and the complete computer program for replication. 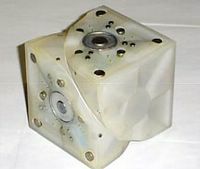 The cubes have electromagnets on their faces that allow them to selectively attach to and detach from one another, and a complete robot consists of several cubes linked together. Each cube is divided in half along a long diagonal, which allows a robot composed of many cubes to bend, reconfigure and manipulate other cubes. For example, a tower of cubes can bend itself over at a right angle to pick up another cube. To begin replication, the stack of cubes bends over and sets its top cube on the table. Then it bends to one side or another to pick up a new cube and deposit it on top of the first. 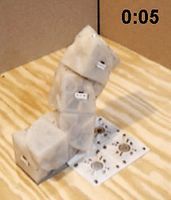 By repeating the process, one robot made up of a stack of cubes can create another just like itself. Self-replicating machines have been the subject of theoretical discussion since the early days of computing and robotics, but only two physical devices that can replicate have been reported. One uses Lego parts assembled in a two-dimensional pattern by moving along tracks; another uses an arrangement of wooden tiles that tumble into a new arrangement when given a shove. Exactly what qualifies as "self-replication" is open to discussion, Lipson points out. "It is not just a binary property -- of whether something self-replicates or not, but rather a continuum," he explains. The new robots in Lipson's lab are also very dependent on their environment. They draw power through contacts on the surface of the table and cannot replicate unless the experimenters "feed" them by supplying additional modules.